Mastering Suite is undoubtedly good, though not as impressive a plug-in collection as we expected from Sonalksis. Bold, chunky interfaces. Limiting is great on reverb and delay tails. StereoTools is highly useful and versatile. Ultimate-D is simple yet comprehensive. Limiting not so transparent. Metering can be misleading. Can't defeat MultiLimit's full-range limiter. No EQ in the bundle. The Mastering Suite comprises Ultimate-D, StereoTools, MaxLimit and MultiLimit. Each one comes in VST, RTAS and AU plug-in formats for Mac and PC. The big draw of the Mastering Suite is bound to be its pair of limiters, so we'll start with the MaxLimit program maximiser. This offers variable release time, down to 1ms, and an automatic mode, where the timing is dependent on the audio material. The Smooth knob isn't a typical limiter parameter - low settings are said to be better for all-out volume maximisation, whereas turning it up aids transparency. Finally, there's a clipping stage (with digital and analogue 'flavours') for increasing the level at the expense of added distortion. A limiter lives or dies by its quality of sound, and our first problem with MaxLimit is that, when pushed, the sound gets louder, as expected, but becomes too smooth and rounded, and you can hear the limiter working. It doesn't distort, but it never achieves the kind of weight, bounce or punch that the likes of PSP Xenon, Voxengo Elephant or Waves L3 Ultramaximizer can manage. However, the very thing that reduces MaxLimit's efficacy for mastering makes it superb at accentuating things like reverb and delay tails when used on mix elements. Funnily enough, we got more mileage out of MaxLimit as a mixing tool. We have to say that we're not keen on the metering in MaxLimit. For example, the gain reduction meter goes all the way down to -33dB or so, but when mastering, it's common to apply far less - an average of around 3dB of attenuation is normal. Therefore, the useful range of the meter is tiny - an option to zoom in on the 0-10dB range would definitely help here. What's more, with fast release times, the reduction meter is 'soft' when compared to other limiters, as though it's too slow to react to the changes. You have to push the limiter harder to see the same kind of meter action as with competing limiters, and this leads to too much gain reduction if you go by the meters, and not enough meter movement when set correctly by ear. MultiLimit is a more complex limiter that splits the signal into up to five frequency bands, applies limiting to each, then routes the lot through a broadband limiter. This enables you to apply more or less limiting to the bass, mid or treble, or even accentuate specific instruments. MultiLimit has similar global controls to MaxLimit, as well as an optional soft knee for more gradual limiting. For each band, you can define the frequency boundaries, change the amount of limiting, set the release time as a percentage of the global release, and adjust the gain. You can solo each band to hear it in isolation, but you can't bypass it whilst doing this, which would've been useful for comparison. As with any multiband dynamics processor, MultiLimit can be a great tool when used wisely, but may do more harm than good in the wrong hands, so it's not one for the novice engineer. It works well enough and has the basics covered, but ultimately suffers from the same limitations as MaxLimit: it's not the most transparent processor around and the metering isn't great. In use, we often achieved the most satisfactory results from MultiLimit with the meters barely showing any action. Furthermore, it's annoying that the broadband limiter can't simply be disabled, though it seems that its action can be circumvented by setting a high global threshold and/or reducing the gain per band. This enables you to limit just the bass, for example, with the other bands untouched (incidentally, this technique works very well with MultiLimit). Ultimate-D is a tool for converting audio to lower bit depths; for example, when creating audio for compact disc, you'll dither down to 16-bit. It's not the most glamorous of plug-ins, but it's certainly handy and has clearly labelled settings, offering options that relate to the style of the music - acoustic/electronic/hybrid - and whether the material is dynamic or compressed. Next comes StereoTools, which offers buttons for phase invert, stereo flip and mid-side input mode, with sliders for balance, panning of both left and right channels, and the all-important stereo width. There's a 'zero width below' slider too, which sets the frequency (from 1Hz to 10kHz) below which audio will be converted to mono. This last function is undoubtedly StereoTools' killer feature, and is most useful for adding tightness and definition to the bottom end, while still enabling you to widen the treble. Finally, there's an analyser section that can depict the stereo image in either a polar or Lissajous (goniometer) format. You can also activate a spectral analyser, for keeping an eye on the frequency distribution. StereoTools is one of our favourites of the pack, and it's spot-on for mixing too, since the ability to widen, shrink and shift the stereo field of certain sounds is key to crafting a good mix. Each plug-in is blessed with a clear, bold interface and chunky controls. The Sonalksis system of 'velocity sensitive' controls (slow movements give finer adjustments) is a great touch, making it easy to set precise values. Setup panels offer such goodies as different metering schemes and settings, adjustments for the steepness of MultiLimit's crossover, pan and balance law for StereoTools and lots more. Our only suggestion would be to move the digital/analogue clip mode switch to the front panel, as you might conceivably want to switch it mid-session. 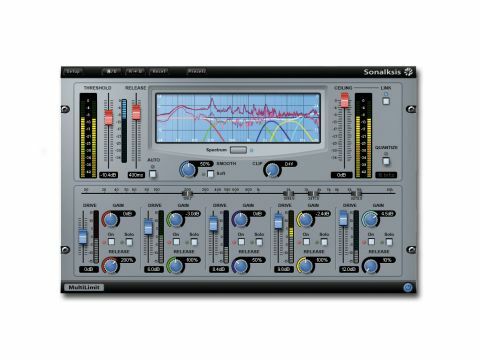 So, should you buy into Sonalksis' mastering tools? We'd suggest trying them before you do. We're not fully convinced by the limiting algorithms, so while MultiLimit is clearly the big gun of the set, it doesn't sell the package alone. The lack of an EQ plug-in is also a tad disappointing for a mastering bundle - after all, dynamics and EQ processors are the staples of any finalising chain. For all of our criticisms, remember that we're judging these plug-ins against the very best in the industry, and though not top of the league, they're in the upper tier for sure. They should certainly still knock spots off the bundled equivalents in your DAW.